The medieval stripe was the cause of disorder and transgression. The modern and contemporary stripe has progressively transformed into a tool for setting things in order. But if it organizes the world and society, the stripe itself seems to remain unwilling to serve any organization too rigorous or too limited. Not only can it function through any medium, but it can be its own medium and, in doing so, open out into the exponential and the imperceptible. All striped surfaces can thus constitute one of the lines in another, larger, striped surface, and so on. The semiology of the stripe is infinite. What better place to reflect on disorder and transgression than the medieval city of Siena? However on my first visit there in 1977, I was too busy enjoying myself to do that. I did climb the bell tower of the Cathedral of Santa Maria. That was auspicious and I’ve reflected on it often. It’s an audaciously distinctive campanile; an enormous construction wrapped in black and white horizontal stripes. Inside the Cathedral I was confronted by what appeared to be an army of black and white marble striped pillars – the colours of Siena’s “Balzana” or arms. That’s all I recall of that first encounter with Siena; being assailed by those aggressive stripes, so apparently inappropriate in a place of silence and worship – that, and the vertigo I felt climbing the tower. Years later, during my residency in the Australia Council studio in Besozzo in Italy, I started drawing coats-of-arms. My content centered on what I understood of the dilemmas associated with cultural dislocation and heraldry seemed a good starting point. You can’t be in Italy and not notice heraldic iconography with its bristling, crisp abstract forms, particularly vertical and horizontal bars. These simple colourful arrangements were eventually to become an integral part of my visual vocabulary. I made my first striped painting in 1992. Voice/Grille is a two-panel work containing all the ingredients that still remain in my work today; the grid, the stripe, a simple figurative emblem and particular attention to colour. It is a grim, emotionally poignant painting that derives from irresolvable personal traumas. James Mollison, who collected the work for the National Gallery of Victoria, may have recognised its significance as the precursor of a change in the direction of my work. It was different to other paintings from that period. I had used abstract structures in earlier works; as large bars to contain forms or as barriers for controlling spatial depth. These abstract strategies are particularly evident in Family of surrogate symbols, 1990. In Voice/Grille, however, the grid and stripe acted both as image and pictorial field. From then on abstract elements began to dominate my paintings. Repetition, multiplication and colour became my central concerns. The exhibition La Nouvelle Constellation, 1992, was all colour, repetition and abstraction. I wanted my work to simultaneously express sameness and difference. My content had not changed but I was moving away from the personal; its narrowness now seemed trivial. To be sidetracked is, after all, to be led astray by a path or an idea, a scent or a tune, and maybe lost forever….To find your subject, you must in some sense lose yourself along the way. I studied Persian manuscripts, Islamic abstract patterning, Chinese and Japanese fabric design, Roman mosaics, Pompeian and Egyptian painting and more. I saw works drenched in resoundingly clashing colours in combinations that confronted, shocked and at the same time, delighted me. Colour has always been vital in my paintings but previously I had used it for atmospheric effect and to suggest emotional tension. We usually see colour as the colour of something – it is not a natural thing to see colour simply as itself alone, unless, of course, we happen also to be painters. For painters, colour is not only all those things which we all see but also, most extraordinarily, the pigments spread out on the palette, and there, quite uniquely, they are simply and solely colour. If my work was to be concerned with colour usage then I needed a way of detaching colour from form, or at the very least, finding a way of rendering form relatively impotent or, better yet, allowing form to willfully surrender to the tantalizing seductiveness of colour. Given what had become by then a love affair with repetitive structures, a sequence of coloured bars seemed the most sensible solution. To a degree I think this was achieved in works like Flying colours and the 10 small works that make up the Lineup series, all from 1996. Breaking up a pictorial field into narrow one-directional segments provided the added benefit of controlling the spatial depth of the work. I was after full-frontal, flat, no space. As there is no distinction between background and shape, or put more neatly, between figure and ground in a work made up of stripes, there is no space. Frank Stella had already solved the problem of abolishing space through his use of a regulated pattern which ‘forces illusionistic space out of the painting at a constant rate’, or ‘such inevitable vestiges of spatial suggestion as remain are kept at even depths by the regular pattern, hence maintaining the possibility of absolute symmetry’. Looking more attentively at my own work I realised that while I had been in control of illusionistic space, the optical vibration and peripheral flux created by particular colour combinations made flatness impossible to achieve. …color can also seem bottomlessly resistant to nomination, attaching itself absolutely to its own specificity and the surfaces on which it has or finds its visibility, even as it also appears subject to endless alteration arising through its juxtaposition with other colors. Subjective and objective, physically fixed and culturally constructed, absolutely proper and endlessly displaced, color can appear as an unthinkable scandal. The story of color and its theory within the history of art is a history of oscillations between its reduction to charm or ornament and its valorization as the radical truth of painting. From these oscillations other vibrations are repeatedly set in motion that touch and disturb matters as purely art-historical as the complex inter-locking borders among and within the individual arts and as culturally far-reaching as codings of race and gender and images of activity and passivity. In 1997 I went to Korea for 4 months to research a ‘different’ colour sensibility; instead I learnt to be more adventurous. Why pursue a single line of inquiry when I could chase many? I did exactly this in the works exhibited in Ghostbusting. This sidetracking allowed me to identify four potentially significant lines of inquiry; ones that might keep me busy for a very long time. The introduction of the diagonal lines in the Out of sight works, 1998–99, redirected me back to architecture. Not to the campanile in Siena’s Cathedral, but to the sensations I experienced during my climb and the dizziness I felt inside its pillared space – disorientation and destabilisation. These, I thought, needed to be deliberately part of my intention. The diagonal bars also made me wonder whether painting on off-square shapes would upset the balance of things even more. 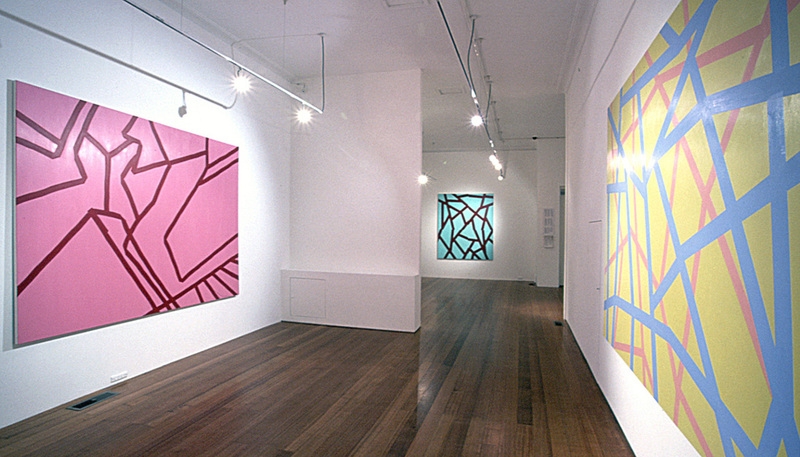 The nine small shaped canvas works in the Off limits series, 1999, were probably the most unsettling works in Ghostbusting – the canvasses were distorted, their arrangement on the gallery wall made the wall look warped and the painted images seemed to be disconnected from the surface on which there were painted. The shapes, of course, functioned both as object and pictorial plane and this made me think about objects. If these surfaces rejected my stripes, what would happen if I took the stripes off their support and gave them a real presence in a real spatial dimension. Confines, 1997–99, was conceived, constructed and exhibited as a floor-to-wall leaning work consisting of 28 wooden planks. I can say this glibly now, but the work was a nightmare to make. I painted the backs of the wooden planks, as well as their fronts and sides; they were, after all, meant to be objects not painted surfaces. The coloured backs and sides recreated, through coloured shadow, the pictorial plane from which I had detached them. I had anticipated a reflected glow on the gallery wall but the illusively striped image that appeared instead was a surprise. I became acutely aware that the act of looking closely and intensely had preoccupied me for a long time. It is to want sight to be anxious, to lose itself and find itself again in an unmoored and faltering drift. For that drift is the only kind of “gaze” one can adopt when one really regards, that is, when one strives to grasp and to gauge painted representations from within one’s just (equivocal and ruptured) conscience of the irresolute present of things. Leanings was also painted in 1999 and presented in the same exhibition. If simple coloured stripes all arranged in one direction could produce sensations of fluttering movement what might occur if I deliberately slanted the lines and subtly changed their angle as I moved across the work from end to end? Indeed, yes, perspective – but perspectival shifts that defied logic and lacked illusionistic intentions. The works of painting burn with the desire to disfigure (or to distort the objectal and corporeal forms we spontaneously identify and in which we recognize ourselves). They undo the numbed vision we have of things – the vision which, precisely, we call “reality”: the visible vision. As a result, the very conditions of that visible vision are tinged with suspicion and thrown into doubt and confusion. I explored this direction further in Scissor kiss, Agrodolce and the several other deliberately optical works I’ve made over the last few years. Overlaying very thin, highly chromatic slanted stripes that imperceptibly change direction along the width or length of the canvas with similar lines that moved in a different direction produced a multitude of intersection points. These cross-over points confused colour reading more noticeably than in earlier works and created a unique and unpredictable moiré pattern. The paintings exhibited in Slipstream and reproduced in this catalogue continue my exploration of colour and the repeated stripe, however this time I have been mainly preoccupied with using abstract bars resembling architectural structures in order to create spatial incongruities. The stripe is a structure that infinitely repeats. Whether it appears on a tiny surface or one of great dimensions, its properties remain the same. The part is as good as the whole, the structure takes precedence over the form. In a way I have returned, yet again, to Siena. This time my Siena is Hong Kong where I have spent much time in the last three years. Hong Kong is a place for reflecting on the nature of the reflected image; something seen through something else, in an almost infinite regress. The fracturing and refractive events that occur in this packed urban space with its hundreds of towers, generates spatial unease and highlights the illogic of trying to locate oneself within a particular space. Disorientation stimulates the act of looking and vice versa. Zoom, Zomp, Pink melt, Viavai and Cat’s cradle request that the viewer patiently and attentively meanders within and through their spatial offerings and that they reflect on the various options for seeing that the works propose. Here I am in front of (a) painting. Of course I am looking at it. But I am just as much under the threat of its gaze. Painting looks at me (la peinture me regarde). It sees me and keeps its eye on me. It summons me to see what I otherwise do not want to see (what I don’t want to admit any regard for [ce donc je ne veux rein savoir]). It picks me out, anxious and undone, but also deliciously displaced, unfettered, and relieved of the weight of my own assent to the obtuse order of things. It makes me delight in a peculiar sort of fear, a fear confessed and overcome – provisionally. Viceversa, Seismic shiver, Off-line 1 and Off-line 2, map the dislodgement of scaffold-like structures along invisible fault-lines. These misaligned bars suggest themselves as forms resulting from an unseen event that has shattered and splintered space. It seems appropriate to conclude with a small foreshadowing of possible future works. Light and air, also reproduced in this catalogue, was created for and installed in the Nanjing Shenghua Arts Center, China, in November of last year in collaboration with Irene Barberis. My contribution to this installation consisted of covering two full-length gallery walls with mirror-streamers that acted simultaneously as stripe and mirror. The work became an ever-changing environment that dissolved architectural structure and space and in their stead returned shimmering light and distorted reflections of everything around and within it – a reflection of an uneasy but fascinating place to be. It will take time and thought to synthesis this experience which will be yet another beginning.